1 Get a pot and fill it with water. Bring to a boil and drop the Knorr Pork Broth Cube. 2 Add pork meat and liver and boil until tender. Remove the meat and liver and cook the shrimps next in the broth. Reserve the broth. 3 Arrange noodles in a bowl. Top with meat, liver, shrimps, egg, garlic, spring onions and chicharon. 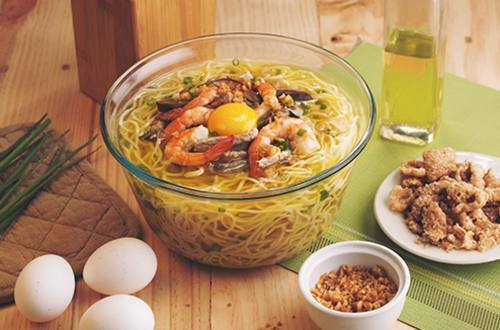 Pour in hot broth and enjoy a big serving of Tanggal Pagod Pork Batchoy. This is all you need to fill your day.